Ray Marshall Law has successfully represented workers’ compensation clients by providing personalized service to hundreds of clients throughout North Carolina. These cases have delivered millions of dollars in Industrial Commission awards and total compensation, including weekly benefits, payments of medical expenses, and settlements. The majority of my workers’ compensation clients have been those whose injuries were so severe that they were unable to ever return to gainful employment and received maximum benefits. Contact Ray Marshall Law today for a FREE CONSULTATION! Injured? If you can’t come to us, we will come to you! Regardless of occupation, every worker is at risk for an injury on the job. The injury may be immediate, such as a construction worker slipping on a scaffold. The injury may occur over time with repetition, such as a stocking clerk suffering a back sprain from heavy lifting or an office worker being diagnosed with carpal tunnel syndrome. Employers are required by North Carolina law to carry workers’ compensation insurance. Thus, workers’ compensation is a valuable safety net for workers who suffer an injury. Legitimate worker’s compensation claims may be denied by aggressive insurance companies. 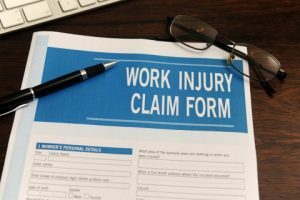 The insurance company will sometimes claim that you have not been injured, or that the injury you have suffered is not serious enough to qualify for workers’ compensation benefits. Our dedicated team of Workmans Comp attorneys can stand up for you and get you the money and medical assistance you deserve! Without an experienced and personally attentive lawyer, you can lose critical benefits, including medical care and financial assistance. Workers’ compensation is set up to help if you are injured at work or develop a health problem as a result of your job. In North Carolina, all employers with three or more employees are required by law to have a worker’s compensation policy that provides weekly payments to cover the loss of earning, medical expenses, and rehabilitation from injury at work. Let Ray Marshall’s team of worker’s compensation lawyers stand up for you! Ray Marshall Law stands up to the insurance company to ensure that you receive all worker’s compensation benefits due to you. Obtain all necessary medical treatment – My office is familiar with medical providers in Winston-Salem, Greensboro and surrounding areas, and we’ll ensure that you receive the best care for your work-related injury or illness. Obtain maximum weekly compensation – We’ll confirm that you’re receiving the correct and fair amount in your short term disability check and when applicable, seek long-term disability, pension, retirement, accident insurance and other benefits. Communicate with your employer and their insurance company – We’ll ensure your employer and their insurance company comply with North Carolina law. Communicate with vocational rehabilitation personnel – We’ll confirm what their role should be in helping you look for a job and ensure that you’re not being forced back to work before you’re ready. $249,000 for worker who had injured his back after falling off of truck who had herniated disc resulting in surgery. $249,000 for worker who injured his back after a machine malfunctioned, causing a metal bar to strike him in the back and leaving him with permanent injuries. $248,000 for worker who suffered herniated discs from fall off of rig, resulting in two back surgeries and permanent disability. $247,500 for worker who slipped on ice on his truck, causing him to fall and injure his back and head; and who, after several surgeries, was unable to return to work. $247,000 for worker who underwent two back surgeries after falling from a truck after losing his balance, resulting in serious disability. $246,000 for worker who ruptured two lumbar discs in fall from roofing ladder and was permanently disabled. $245,000 for worker who suffered neck and shoulder injuries, resulting in surgeries, when a box of metal parts fell from a high shelf, striking him and leaving him permanently disabled. $245,000 for worker who herniated lumbar discs, resulting in lumbar fusion surgery, from a lifting injury, leaving him permanently disabled. $244,500 for worker who herniated a disc in his back and injured his shoulder when he fell from a truck after tripping on a hose, resulting in surgery and permanent disability. $243,500 for injured worker who herniated his lumbar disc and injured his knee in fall from the truck, resulting in lumbar fusion surgery and permanent disability. $240,000 for injured worker who herniated his lumbar disc and injured his elbow, resulting in surgeries from fall from rig, resulting in permanent disability. $240,000 for worker who herniated disc when a heavy package he was carrying slipped and he tried to catch it, resulting in two surgeries and permanent disability. $235,000 for injured worker who slipped on a wet spot in work eating area, rupturing two discs, resulting in lumbar fusion surgery and permanent disability.